Aircraft landing gear overhaul is often viewed as a behind-the-scenes inspection and scheduled alongside, but taking a backseat to, a major airframe inspection. However, it can have a huge impact on the entire project's schedule if the landing gear restoration runs into major squawks. Because an aircraft can't go anywhere without its legs. XOJET is a leader in private jet travel that is personal, flexible, and on-demand. 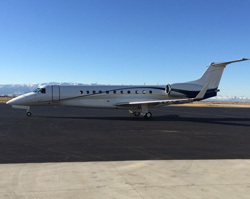 Headquartered in Brisbane, California, the company operates a fleet that includes Bombardier Challenger 300 and Cessna Citation X aircraft. Although XOJET has only been in business since 2006, this modern alternative to fractional ownership is definitely in demand. According to Carlos Partida, Senior Maintenance Planner at XOJET, the company’s fleet flies 40% more flight hours per aircraft per year than their closest Part 135 competitor. "Our fleet is smaller by comparison to our competitors," says Carlos. 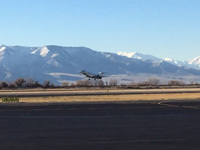 "Making sure the aircraft are available as much as possible is one of my top priorities." Needless to say, that makes downtime very important. 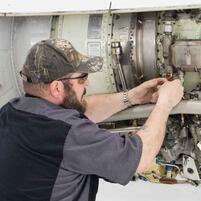 And if you ask Carlos, no one manages downtime better than Duncan Aviation. Since 2014, Carlos has been sending all of XOJET’s Citation X oleo sets to Duncan Aviation for inspection. 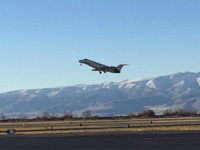 They are nearly always returned to service and headed back to XOJET within a week. Prior to using Duncan Aviation, Carlos was used to waiting months. 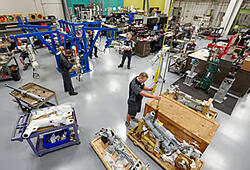 "It takes Duncan Aviation a week, including shipping, to do something that previously took two months for completion." Of course, Citation X oleos are not the only gear Duncan Aviation services for XOJET. 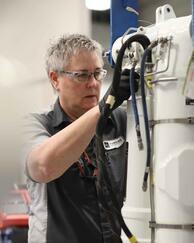 Our Accessory shop regularly has a complete set of the fleet’s Challenger 300 gear in the shop for 96-month inspections. Switching to Duncan Aviation was not only a time saver, Carlos says. 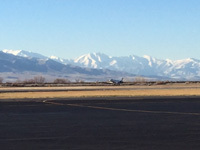 It has had a positive impact on XOJET’s bottom line. "When our aircraft are not flying, they are not producing revenue." Carlos also expresses his appreciation for the level of customer service he has received from everyone at Duncan Aviation. "They always deliver the highest in quality work at the best possible downtime savings, served up with a level of customer service that is first rate. Everyone on the Duncan Aviation team is so willing to accommodate all of my requirements. I can’t speak highly enough about the customer service," he says. 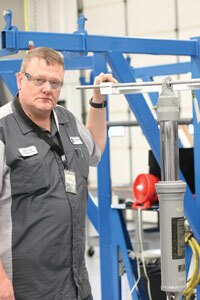 Chris Fields is a Duncan Aviation Master Technician working on the landing gear team since 2008. He knows a thing or two about landing gear and he knows a lot about the Challenger 300 and Citation X gear that come off of XOJET aircraft. When XOJET sends their gear sets to Duncan Aviation, Chris often takes the lead, especially when it comes to the Citation X main gear oleo doc inspections. "XOJET takes great care of their gear. They schedule inspections on time and everything is well-documented," says Chris. "We see several sets of oleos every year and typically will have them completed and returned within four days." Duncan Aviation has acquired the capabilities to completely overhaul and repair landing gear for both commercial and business Embraer aircraft at our Lincoln, Nebraska, facility. With the necessary technical data, maintenance manuals and aircraft landing gear parts, Duncan Aviation's Accessories Services has received and successfully overhauled its first set of ERJ-145 landing gear. 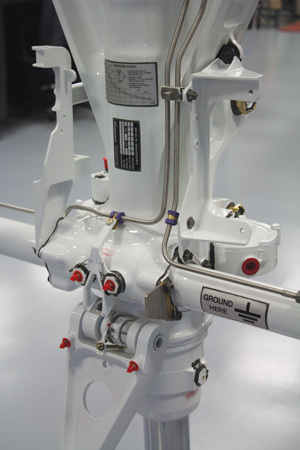 "We have been completing landing gear inspections and overhauls on the most popular business aviation make/model landing gear for 30 years," said Tony Curtis, accessories team leader. "There were no surprises with the Embraer landing gear." He explained that landing gear all perform the same basic function and have similar features and load capacities appropriate for the aircraft. The only difference was learning the uniqueness of the Embraer gear. 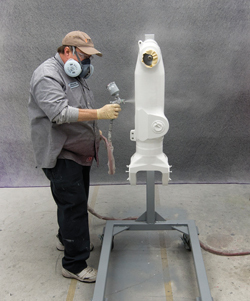 In 2013, the aircraft accessories shop in Lincoln, Nebraska, went through major renovations that more than doubled the shop area, gaining approximately 6,300 square feet of service area, doubling its work benches and adding new tooling and in-house capabilities, including an overhead crane and a new paint booth with curing room. Tony's team is trained, experienced and equipped with the proper tooling and access to Embraer parts and repair processes. For more information, contact Duncan Aviation accessories service sales for quotes and scheduling information. Take a moment and watch this before and after ERJ-145 overhaul video. A near-record number of landing gear sets and components are in-house at Duncan Aviation’s accessories shop in Lincoln, NE. According to Tony Curtis, landing gear team leader, seven full sets of landing gear and a “whole slew” of individual components, such as struts and oleos, have filled the shop and kept the schedule very busy. All shifts are working tirelessly overhauling or inspecting gear sets and components from Challenger 300, Challenger 604, Challenger 601, Learjet and King Air aircraft. 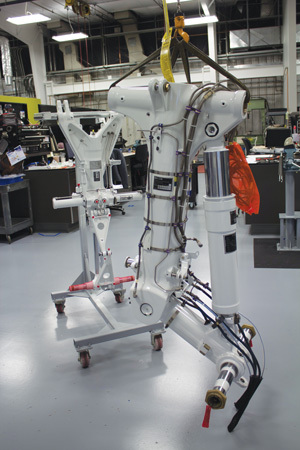 Because an aircraft can’t go anywhere without its legs, Duncan Aviation has invested heavily in the landing gear customer more than doubling its Accessories shop area, gaining approximately 6,300 square feet of service area, doubling its work benches and adding new tooling and in-house capabilities, including an overhead crane and a new paint booth with curing room. In 2014, they acquired the capabilities to completely overhaul and repair landing gear for both commercial and business Embraer aircraft. 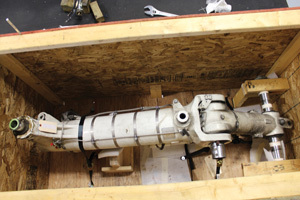 With the necessary technical data, maintenance manuals and aircraft landing gear parts, Duncan Aviation’s Accessories Services has received and successfully overhauled two sets of Embraer gear to comply with the 144-month landing gear restoration. 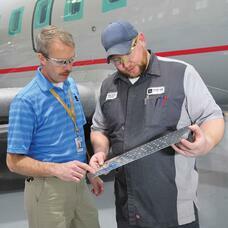 For Duncan Aviation’s Accessories area, 2013 was a year of growth. 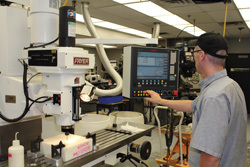 The service shop doubled in size and cutting edge technology bolstered available in-house capabilities. This growth and accompanying shop enhancements were all completed with the customer in mind. Marty Lincoln, manager of Duncan Aviation’s accessories area, is serious about doing all he can to support every accessories customer. “By investing today, we are prepared tomorrow to meet all of their needs in our house,” he says. Here’s a brief glimpse into the 2013 expansion of Duncan Aviation’s Accessories Services featured in the Spring 2014 Duncan Debrief. The expanded accessory shop service area added approximately 6,300 square feet, doubled bench space and added new tooling and expanded in-house capabilities, including an overhead crane and a new paint booth with curing room. A new 300 square foot paint booth and a 400 square foot curing room increase work capacity and improve efficiency. The new Fryer Machine Systems CNC mill has a near 3,000 pound load capacity, a table size of 17x63 inches and a position accuracy of +/-0.0002 of an inch. 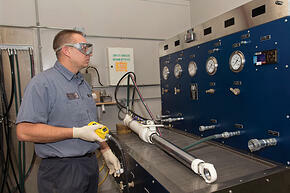 The in-house hydraulic Skydrol test bench provides additional capacity and capabilities for large-body aircraft. Click on the link below to continue reading other feature articles in the Spring 2014 Duncan Debrief magazine. When the landing gear actuators on the King Air 90 and 200 model aircraft arrive at Duncan Aviation for their six year or 8,000 cycle overhaul, the first thing performed is the actuator screw and nut end play inspection on each actuator assembly (two main/one nose). The end-play inspection measures the play between the threads of the screw assembly and nut assembly. 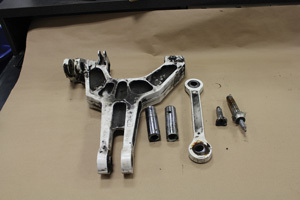 A large majority of the time the nut assembly will require replacement due to extended wear. The actuator screw and nut end play inspection should be performed every 1000 cycles or 30 months, whichever comes first. 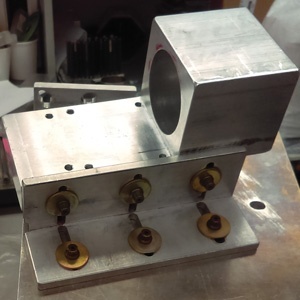 The allowable tolerance between the actuator screw and nut assembly is .016 of an inch, but the actuator can remain in service up to .018 of an inch but must be re-inspected every 200 cycles. If the inspection finds the tolerance beyond .018 of an inch, the landing gear actuators must be sent in for overhaul. Keep in mind that even if the Actuator passes the end play check at 1000 cycles or 30 months, it may not pass the more stringent end play check required by the overhaul manual. The maximum allowable end play at time of overhaul is only .009" before it must be replaced. This nut assembly wear is caused because the nut assembly is made of a bronze material that rubs against the steel screw assembly. Symptoms of extended tolerance could be a loud noise when the LG is extended and retracted. If any foreign material were to get in between the threads, this assembly will bind up and the LG will no longer be able to extend or retract. If you should have any questions about this, don’t hesitate to contact me. 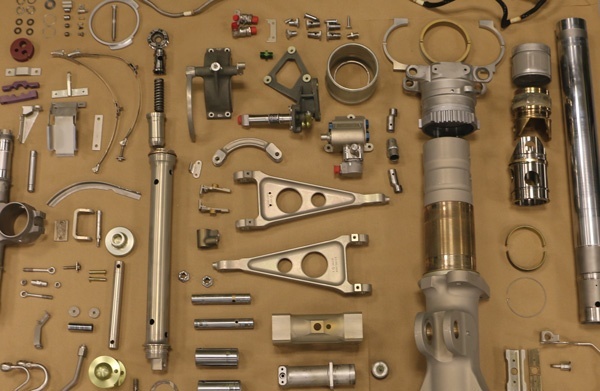 To schedule your King Air 90/200 landing gear overhaul, contact your Duncan Aviation accessories customer account rep.